General Conference registration opens today! General Conference will culminate our 50th Anniversary year so we are excited to announce the theme for this global gathering, our worldwide jubilee is: Celebrate! Mark your calendar and register today as we celebrate the 50th Anniversary of Metropolitan Community Churches at General Conference in Orlando, Florida, USA 1-5 July 2019. This conference will kick-off with an event on Sunday night to remember our history, so plan to come early. The week will feature more celebrations of our history and our future as we gather to worship, tell stories, dream, plan, and learn together. You can expect excellent worship, meaningful workshops, fun entertainment, and challenging plenaries. We are making some exciting changes to the program in honor of our 50th Anniversary that include: a day-long plenary focused on being a local and global human rights church, worship that honors our international diversity, and even a half-day off to go to area theme parks. Look for more information on all these things as we get closer to General Conference. To stay up-to-date on all the planning and relevant information visit the conference website at celebrate.mccchurch.org You can also download the app. Search for Metropolitan Community Churches in your app store. Click Here To Register for General Conference! Look for more information from the 50th Anniversary Team who is working on events and activities that will lead up to General Conference. So far, ideas include a storytelling campaign, events at Founders MCC on Anniversary Weekend, and great archival efforts. MCC’s 50th Anniversary is on 6 October 2018 and to kick-off the worldwide celebration, we encourage congregations to hold all the Sundays in October and the first Sunday of November to celebrate MCC. 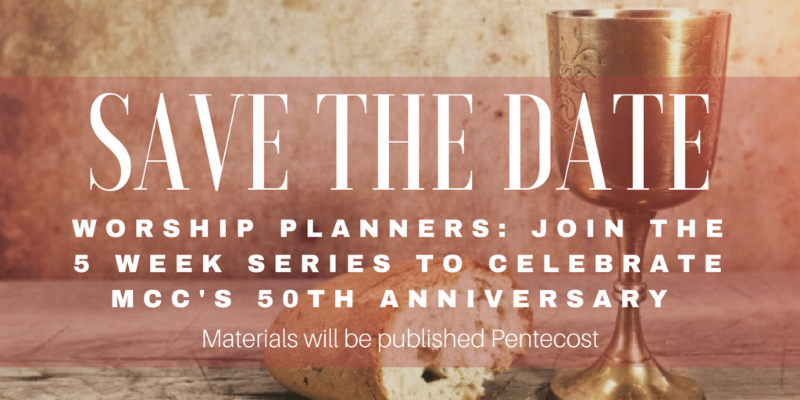 Worship planning materials will come out on Pentecost!